The Socket SoMo 650 has been discontinued. No direct replacement is available. SoMo 650 makes small- to mid-sized deployments possible and affordable for a wide range of mobile business applications, including sales force automation, inventory management, patient care, merchandising, asset management, mobile POS and hospitality. This durable, customizable handheld computer includes the Socket Mobile enterprise class implementation of Bluetooth and Wi-Fi to keep you connected. Or choose the radio-free SoMo 650 for high security or batch-oriented environments. Windows Mobile 5.0 Premium Edition OS, TFT active matrix display, 240 x 320 display, 16-bit colors, 128 MB RAM, 624 MHz Processor, Bluetooth 2.0 EDR, IEEE 802.11b, IEEE 802.11g connectivity, 1 x headset - sub-mini phone stereo 2.5 mm, 1 x USB, Lithium ion battery, Touch-screen, 5-way navigation button, Stylus input.Gray Color. Windows Mobile 5.0 Premium Edition OS, TFT active matrix display, 240 x 320 display, 16-bit colors, 128 MB RAM, 624 MHz Processor, Bluetooth 2.0 EDR, IEEE 802.11b, IEEE 802.11g Connectivity, 1 x headset - sub-mini phone stereo 2.5 mm, 2 x Hi-Speed USB (on supplied cradle), 1 x USB, Lithium ion battery, Touch-screen, 5-way navigation button, Stylus input, included carrying case. 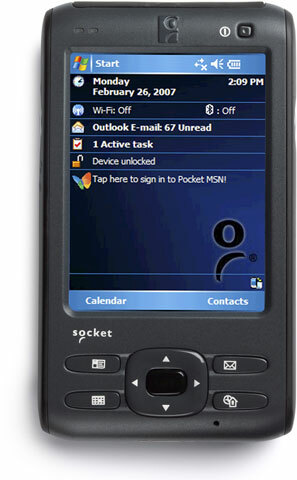 Wireless Handheld Computer (650-E, Includes Microsoft Office Mobile, Windows Mobile 6, 256MB, 2600 mAh, N.A., English), Includes AC Adapter & Sync Cable. Barcode scanner can be ordered separately, see accessories.